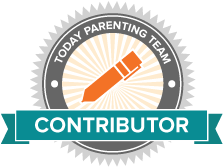 Will my kids eat Kimchi Fried Rice? I think not. My kids are the pickiest eaters. They like to eat bland food with ingredients they know. If I add one item that looks foreign, forget it. They want cereal instead. It’s hard to make one meal the whole family will eat. So when I wanted to make Kimchi Fried Rice, I had to think of what else I could make at the same time for the boys. To make life easier, I decided to use as many ingredients from Kimchi Fried Rice I could, then substitute items to match the boys’ palettes. Many of you who have young kids may have this problem, so this post focuses on making TWO types of fried rice at the same time. Yep, two. And I know you can do it because I did. And both recipes are great even if you don’t have kids! I used edamame and carrots to substitute the kimchi in the fried rice for the kids. The rest of the ingredients are the same. These dishes are easy to prepare. Are you ready? You are going to love it! Before I go in depth about the recipe, have you tried kimchi? “Kimchi has powerful antioxidants and provides an additional benefit of probiotics in the form of lactobacillus bacteria. It contains numerous healthful components including capsaicin, chlorophyll, carotenoids, flavonoids and isothiocyanates with a low amount of fat and sugar.” Click here for more info on kimchi. On top of all this, it has very few calories. It’s a super food! It’s become so popular among vegetarians and healthy food consumers in the past few years, but in Korea it’s a staple in the home. Ingredients for Kimchi Fried Rice: Day old short grain rice, kimchi, onion, thick cut bacon, butter, eggs, soy sauce and sesame oil. Do you tear up when cutting onions? Try cutting it in a pie shape before separating to cut into smaller pieces. I have to mention this Zyliss manual food chopper is brilliant and saves me so much time. I first heard about it at Grace-Marie’s Cooking class at Bristol Farms but was resistant to buying it because it seemed pricey at $30 for what looked like a piece of plastic. I finally caved and bought it when she talked about it during subsequent classes. It’s so awesome and saves a ton of time. No joke. I simply pull the red lever a few times and look at the onions it gives me. I should be connected to them as an affiliate (but I haven’t signed up yet)! Since my kids are so picky, I have to chop the onions in very fine pieces and try to hide it in the food. Cut the thick cut bacon into small pieces before frying. What seems like a lot of bacon turns into virtually nothing when it is cooked! You will need to drain the fat at least once while cooking to allow bacon to crisp. Once done, set aside. Kimchi should be cut into small pieces. Kimchi is now sold at most supermarkets in the cheese/tofu section. My Korean friend, Julie likes to wait until the kimchi is about 2 weeks old before using it for fried rice. She says it is tangier that way and makes the fried rice taste better. I think it tastes just as delicious using new kimchi. If you are in the LA area, go to Koreatown’s Galleria Market on Olympic or Torrance’s S-Mart if you are in the South Bay. You may feel out of place surrounded by little Korean ladies with the same bob haircut, but they will have the best selection of kimchi and it will be 1/3 the price of regular supermarkets. I am always shocked by the long lines in front of the Korean stand at the Manhattan Beach Farmer’s Market where the food is brought down from Koreatown and marked up probably 4 times. Korean markets also have great produce sections at a fraction of the cost of regular markets. Kimchi is so potent that when I buy it, the whole fridge ends up smelling like kimchi, so I like to use it up as soon as I can. Koreans who eat kimchi on a daily basis have special sealed containers or put their kimchi in a separate refrigerator to contain the smell. Ingredients for Edamame, Carrot & Bacon Fried Rice: Replace kimchi with 1 cup carrots and 1 cup edamame. I just throw the baby carrots in the chopper and pull the lever! I bet you will get one of these. It cleans easily too. The only downfall- you can’t over-stuff it. In a nonstick sauté pan or cast-iron skillet, melt butter over medium-low heat and add onions. Cook, stirring, until the onions start to sizzle, about 2 minutes. I used the left side for Kimchi Fried Rice and right for Edamame Rice. I used the same pan I fried the bacon for the Edamame Rice (which is why the right side is goldish in color). Add kimchi and kimchi juice to one pan and stir until it comes to a boil, about 3 minutes. Add carrots to the other pan. Stir. Add 8 oz of bacon to each pan (half the package of bacon) and cook until sauce is nearly dried out on left side, about 5 minutes. On right side, cook bacon/carrot/onion mix for an additional 2 minutes. Break up the rice in both pans with a spatula and stir it to incorporate. Turn heat to medium. Cook, stirring, until the rice has absorbed the sauce and is very hot, about 5 minutes. Stir in soy sauce and sesame oil. Taste, and adjust with more soy sauce, sesame oil or kimchi juice. Turn heat down to low, but let the rice continue to cook, untouched, to lightly brown while you cook the eggs. Now make the fried eggs. Place a small nonstick sauté pan over medium heat with a little vegetable oil and fry the eggs to your desired doneness. Serve rice topped with fried eggs, (and if desired) nori and a sprinkle of sesame seeds. 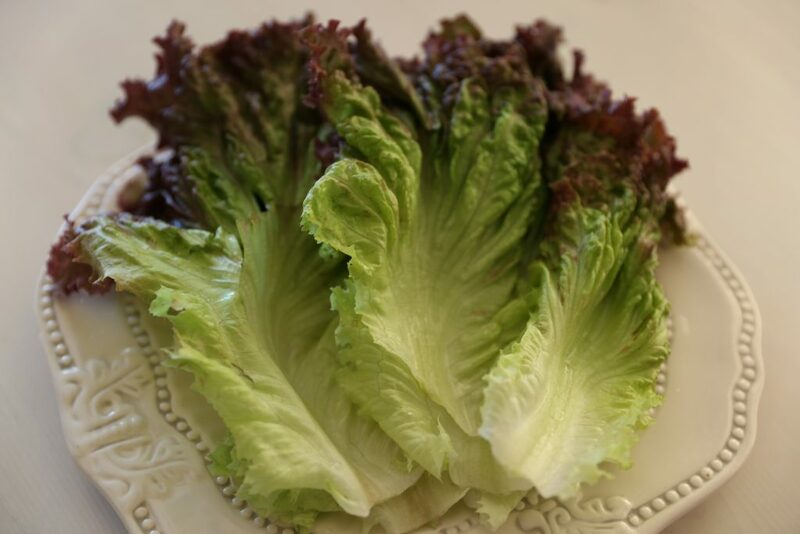 Red Leaf Lettuce is great to make Kimchi Rice wraps. I love the crunch with the spicy bacon flavor. So what do you think? Is your mouth watering? It is so easy and sooooo delicious! Let me know how it turns out for you! And if you liked this post, check out my post on Tofu Bibimbap. Friday nights dinner! Yum! Thanks Jen. How did it turn out? Yuuuuuuum.